Say what you will about how horrible 2016 was; it was a great year for books all around. The stakes are way too high to lock one’s self away in a Scandinavian country and read them all over the next four years. These five books stand out particularly because they provide clues on what good organizing might look like in the years ahead. In Defense of Housing, by David Madden and Peter Marcuse (Verso). The president-elect made sure that commentators and pundits from across the political spectrum had steady work in 2016, but one aspect missing from the discussion was the implications of having a real estate developer as the nation's commander in chief. In Defense of Housing clearly lays out the systemic nature of the housing crisis and seamlessly breaks down complicated economic concepts. Madden and Marcuse gently disabuse readers of illusions that the end of the housing crisis is just a policy tweak away. 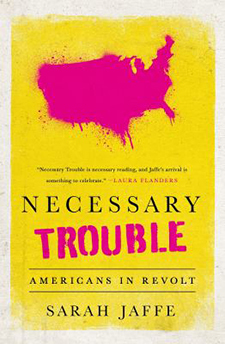 Necessary Trouble: Americans In Revolt, by Sarah Jaffe (Nation Books). Jaffe dignifies and contemplates recent social movements including Occupy, anti-Stop and Frisk, and the Fight for 15. Necessary Trouble is necessary reading as an antidote to advent-of-fascism blues. It belongs on the same bookshelf as Piven and Cloward’s classic Poor People’s Movements: Why they Succeed and How They Fail. Policing the Planet: Why the Policing Crisis Led to Black Lives Matter, by Jordan T. Camp and Christina Heatherton. (Verso) An incredible anthology tracing the bloody history of broken-windows policing and its implications for city life in general. Policing the Planet is even more relevant with a president-elect who has publically praised stop-and-frisk policing and has a friend in Rudy Giuliani. It’s a solid collection with stand-out contributions from Robin D.G. Kelley, Rachel Herzing, and Ruth Wilson Gilmore. From #blacklivesmatter to Black Liberation, by Keenanga-Yamatta Taylor (Haymarket Books). This book describes a politics where anti-racism and class can co-exist, fortify one another, and ultimately change the course of history. It is a book for today’s young organizers and grounded in historical analysis. Nonviolence Ain’t What It Used To Be: Unarmed Insurrection and the Rhetoric of Resistance, by Shon Meckfessel (AK Press). We know the script. Movements get big. Protests surge. Then, activists tear each other down debating nonviolence, violence, and property destruction. Meckfessel elevates this debate by engaging on the level of strategy and tactics. He avoids the pitfalls of more-radical-than-thou rhetoric and provides his readers with the tools to think through the hard questions that arrive with mass mobilization. James Tracy is a Bay Area native and a community organizer. He is co-founder of the San Francisco Community Land Trust and is on staff at Community Housing Partnership. He is the author of, Dispatches Against Displacement: Field Notes From San Francisco’s Housing Wars, as well as co-author of Hillbilly Nationalists, Urban Race Rebels and Black Power: Community Organizing in Radical Times.